Michelle Simmons is the Director of the Australian Research Council Centre of Excellence for Quantum Computation and Commnication Technology, a Federation Fellow and a Scientia Professor of Physics at the University of New South Wales. Following her PhD in solar engineering at the University of Durham in the UK she became a Research Fellow at the Cavendish Laboratory in Cambridge, UK, working with Professor Sir Michael Pepper FRS in quantum electronics. In 1999, she was awarded a QEII Fellowship and came to Australia where she was a founding member, and now the Director of the Centre of Excellence. 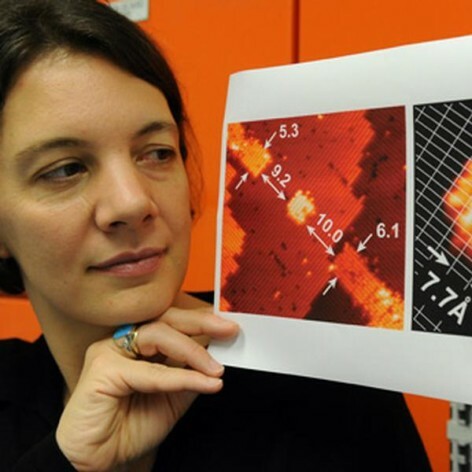 Since 2000 she has established a large research group dedicated to the fabrication of atomic-scale devices in silicon using the atomic precision of a scanning tunneling microscopy. Her group has developed the world&apos;s thinnest conducting wires in silicon and the smallest transistors made with atomic precision. She has published more than 300 papers in refereed journals and presented over 80 invited and plenary presentations at international conferences. In 2005 she was awarded the Pawsey Medal by the Australian Academy of Science and in 2006 became the one of the youngest elected Fellows of this Academy. In 2008 she was awarded a second Federation Fellowship by the Australian Government and was named the NSW Scientist of the Year in 2011.